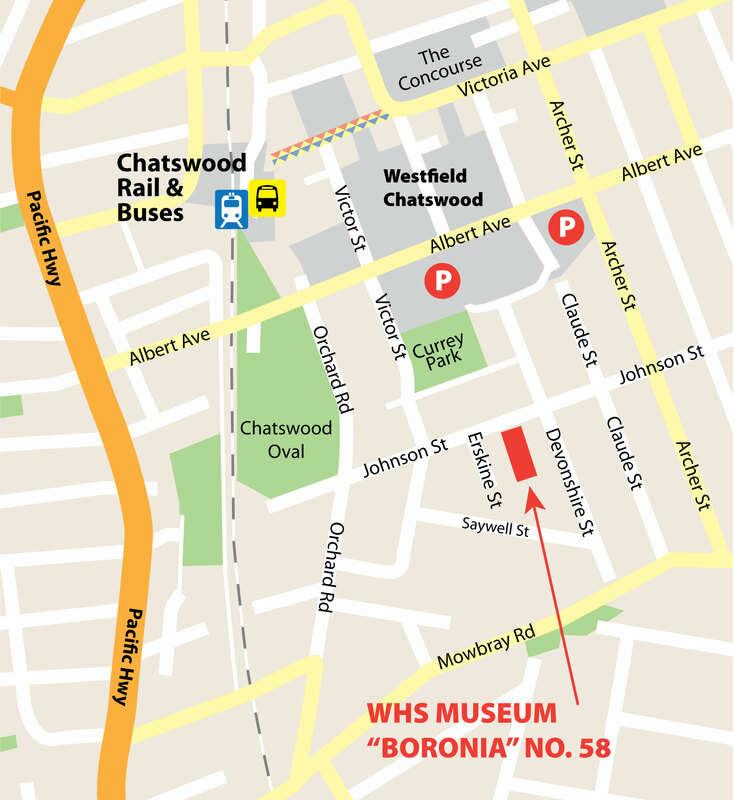 The museum is located at 58 Johnson Street, Chatswood. It is adjacent to the Chatswood Central Business District and within easy walking distance of the Railway Station, bus interchange and the Victoria Avenue Mall and shops. From the station and bus interchange, take the south exit from the station concourse and walk through the Garden of Remembrance to Albert Avenue. Turn left (away from the railway) a block to the lights on Victor Street, cross Albert Avenue (to the right) and walk south along Victor Street one block to Johnson Street. Turn left and the museum is a short walk to the east on the other side of the street. If arriving by bus along Victoria Avenue, alight at the bus stop near the Westfield entrance. Walk up Victoria Avenue and the Mall to Victor Street (the T-junction in the centre of the Mall) and go one block south to the lights at Albert Avenue then follow the route described above. The museum does not have car parking facilities, but the Westfield car park nearby has two hours free parking available. Enter from Devonshire Street (off Johnson Street) and park as close to the Devonshire Street entrance as possible. Take the stairs nearest to the entrance to the ground floor and walk along Devonshire Street back to Johnson Street. The museum is located across the street. Two hour street parking is available in Johnson and adjacent streets.